Where have Bondway's products like vet ultrasound scanner been exported to? 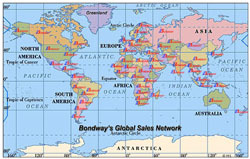 Over the past 11 years since Bondway was established on July 11 2006, we've exported our products to over 110 countries or regions till now. We're proud to see a huge demand for our products thanks to the excellent performance, standardized production process and strick quality control, fast response of our salesteam and service engineers.,etc. Asia: Thailand, Vietnam, Singapore, Indonesia, Malaysia, Yemen, Saudi Arabia, Lebanon, Iraq, Iran, Syria, Pakistan, India, Bangladesh, Azerbaijang, Georgia etc. Europe: UK, France, Belgium, Ireland, Italy, Finland, Sweden,The Netherlands, Czech, Spain, Romania, Hungary, Bulgaria, Albania.